Everyone knows New York City is home to the world’s best bagels. But what about the breakfast carb’s sidekick? 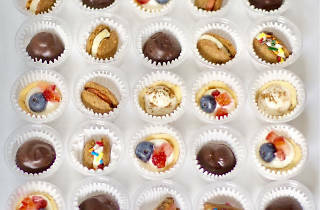 Becky’s Bites, a cream-cheese–focused catering company from Becky Rosenthal, has opened its first brick-and-mortar location in the East Village. 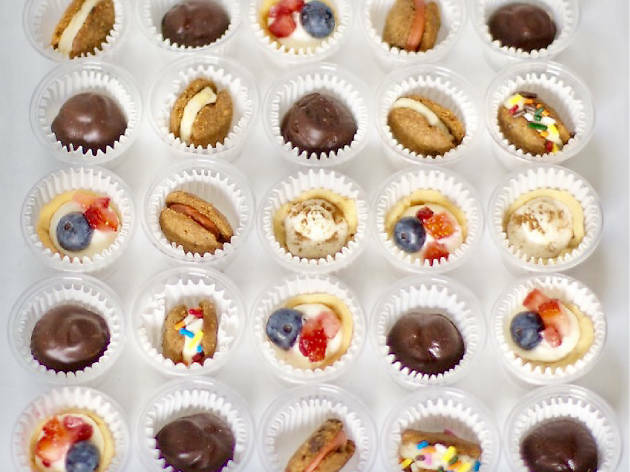 The shop serves minibagels, tiny tarts, cookie sandwiches and parfaits—all with a cream-cheese component. And there won’t just be your typical spreads like plain or lox, either. Look for premade flavors like peanut butter, cappuccino and cookies-and-cream to slather on the savory dough sandwiches. For wholly sweet snacks, try the Childhood Throwbacks dip combos like Beckaroos with Teddy Grahams cookies and funfetti dip, and Cinnamon Crunch with cinnamon-sugar cookie chips and vanilla dip. Great recommendation! I'm so glad I listened and tried Becky's Bites - now I'm addicted! Incredibly delicious, what a tasty addition to the neighborhood. They've got me hooked on breakfast (loaded lox + sesame bagel please! ), snacks (salty side & s'mores & chill please!) AND dessert (box of 12 greatest hits bites please!) Can't wait to go back!